It's a strange feeling to be told "whatever you do don't put anything down on the ground". The warning is serious and it sends a shiver down the spine. As we enter the innermost part of Sellafield it becomes clear how much those tasked with decommissioning the plant have still to learn about what they are taking on. Sellafield's oldest sector is a known unknown. It's the first time a British TV crew have entered the area that was at the heart of the country's very first foray into the nuclear age. Potentially everything around us is radioactive. There was no proper inventory made back in the day. The Cold War was raging and Britain needed nuclear weapons to fend off the threat from the East. In west Cumbria a top secret programme was under way. The construction of nuclear reactors was a priority. As the accompanying cooling ponds and chimneys were built at breakneck speed no-one ever thought about the day it would all have to come down. The default position of those trying to make it safe is that everything is potentially lethal. When this part of the nuclear site was abandoned it was simply locked up. For decades it was out of bounds to all but the maintenance crews. Only now are people venturing back inside to tackle its radioactive legacy. I've been inside nuclear plants, waste stores and repositories before; but nothing quite prepared me for this. As we approached the water ponds which were used to cool and store nuclear waste, I suddenly squinted because my eyes were surprised by daylight. This once top secret operation was literally out in the open. The ponds are still, reflecting the clouds above. Imagine a massive concrete open air swimming pool, only here you can't even dip a toe. The water is radioactive. Beneath the surface lurks the problem. Old fuel rods and who knows what else lie on the bottom. Then the next surprise, although it should have been obvious to me. A seagull swoops down and lands on the water. I wish it away, but it stays and then it takes a drink. My own guts almost go into spasm as I contemplate the implications for the bird. Why on Earth was this ever left open to the elements? My guide tells me that when it was built after World War II they weren't thinking about the future because they didn't know if there'd be a tomorrow. Covering it now is not an option, we're told, as an original crane has to travel along its length to get access to waste below. While doing a piece to camera I'm positioned next to a warning sign which screams - 'Do not linger here'. Of course I move on, but the gulls are blissfully unaware of the danger. Another issue with the ponds is that wind and rain bring dust and dirt. Over the decades it has settled in the ponds, so now there's also a contaminated sludge that is going to be a nightmare to scoop up and dispose of safely. Then there are large concrete silos. Only these don't store grain, but a junk pile of old discarded waste. Again there's no list of what's inside. They'll have to open it up and invent ways of dealing with what they find. It is a monumental task and one that won't be finished in my lifetime. As we leave the inner zone we discard our over-clothes, and insert our bodies into a succession of monitoring machines that ensure we are clean. 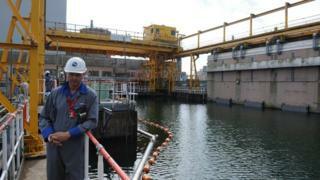 The decommissioning teams must take this process as a daily routine. Inside Out is broadcast on Monday, 23 September at 19:30 BST on BBC One, and nationwide for seven days thereafter on the iPlayer.